Although the water service line runs from the water main underneath your street to the water main under your house, in most areas it is your responsibility to take care of Water Line Replacement. If the water service line is broken, fractured, or clogged, it is typically up to you to have it repaired or replaced. The good news is that M5 Plumbing Services LLC provides efficient Water Line Replacement in Gresham. Serving homeowners and business owners in the Vancouver, Gresham, and Portland metro areas, we are the full-service plumber for you. Our Water Line Replacement technicians are highly trained and qualified to repair or replace your water service line. We keep our customers informed every step of the way so that they will understand what they are paying for. We offer FREE estimates on all Water Line Replacements! We are locally owned and operated plumbing company. We have a large customer base of highly satisfied customers who call us for their every plumbing and remodeling need. We serve residential and commercial customers with diverse services that include drain cleaning. 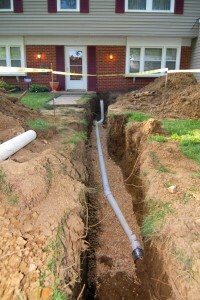 We can replace the water lines while remodeling your kitchen or remodeling your bathroom. We already have the tools and materials needed to repair or replace your water service line and complete your plumbing additions. Our technicians pay great attention to detail so that your water line replacement gets done right the first time. Every customer is treated with dignity and respect, just as if you were our own neighbors; because you are.